These images show cross-sections of a medium voltage power cable that was installed at a wind farm in Wyoming. In this case, the IMCORP Factory Grade® technology indicated partial discharge activity on a section of cable. The PD location was not immediately apparent after the cable was excavated and visually inspected. As the same phenomenon had occurred in one other cable at the site, the site managers decided to send one cable back to the manufacturer and one cable to IMCORP headquarters in Connecticut. 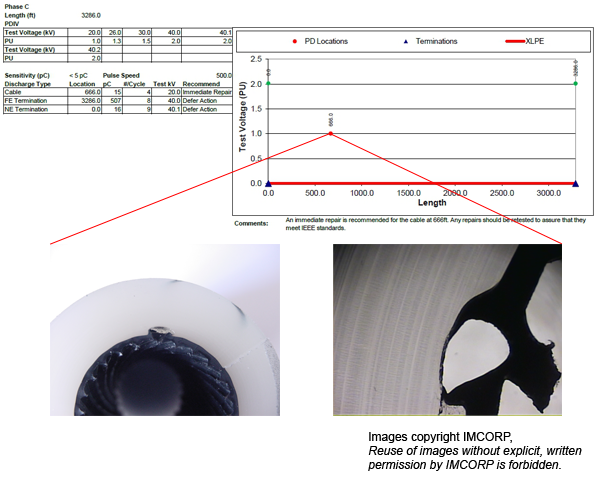 IMCORP promptly conducted another Factory Grade® assessment on the cable section. After a precise location had been determined, the cable was then given a hot oil bath to render the insulation transparent. Once the location of the protrusion in the semi-con had been visually confirmed, IMCORP cut the cable to gain the cross-section view shown above. This process is unique to IMCORP and a service that we offer our clients that are interested in root cause analysis. The protrusion seen in the semi-con was the result of shipping the cable before completion of the degassing process. During cable fabrication, the strands are filled with material to prevent internal moisture buildup. After this process, the cable must be allowed to degas as it cools. Here, the cable was packaged and shipped before the degassing process was complete. When the cable was spooled in preparation for shipping, a trapped pocket of gas forced a protrusion through the semiconductor - an ideal scenario for fostering PD activity.